We have to admit that the brand name Erengi is not yet common in most art circles. But who cares—this is one fun and serious art media! Oil pastels offer so many advantages for today's artist that it is almost a crime that many oil colorists do not have a serious set of these in their studio. Did you know that it is illegal to travel by plane with any oil color solvent? 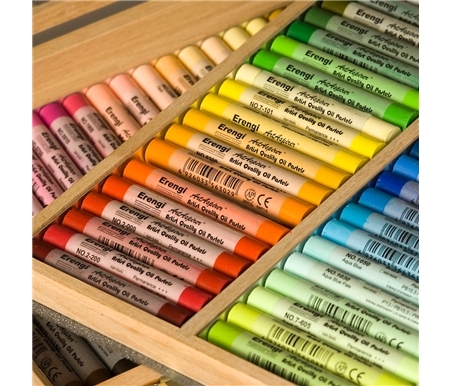 Did you know all you need to paint in oils are these oil pastels, brushes and some linseed oil? Extender Blender Stick - This ingenious blending stick is basically clear base medium in a convenient stick form. It allows you to get those subtle blends with ease and creates many avenues for painting. For instance you can base coat your canvas or paper with the extender and then basically paint into a surface that automatically makes the color more transparent and makes lines more free flowing. Imagine all the neat adventures they'll lead you on. Erengi ArtAspirer Oil Pastels is rated 4.6 out of 5 by 9. Rated 4 out of 5 by vinmous from Single color set vs. assorted colors box set I bought a 25-color set and I was happy with them. Colors are brilliant and they layer nicely, but some colors need more work than the others. I ran out of the middle green so I ordered a 12-piece box of it. It came without delay and when I tried it, the quality was not the same as the one on the assorted color set. They were harder, drier, and not as brilliant. Perhaps it was old stock? I still used them though, just have to layer more and to wait for them to dry well before layering. The pastel was good but maybe they can check the stock before sending them to make sure they are not too dry/old. Rated 5 out of 5 by KikiMissCara from Impressive I tried these recently and was very impressed with the feel and blendability. The colors are vibrant and the texture smooth. I enjoy working with mixed media and these will definitely work well for me in my creating. They are soft and will layer well. Rated 5 out of 5 by KML from Great oil pastels, great price! Love these oil pastels. I use them for finished art, but at this price I can also use them to play around and just have fun. They blend nicely, great colors. Occasionally I use a fancier oil pastel for finishing touches over the Erengis. I buy the ses of 50 on sale and that way I always have them around as gifts for friends too. Then I buy extra boxes of 12 whites and my other favorites too. Rated 4 out of 5 by Great Lakes Artist from Ignore the goofy name... There is nothing "aspirational" about these OP's. They are solid performers, soft enough to blend-- no more streaked skies, if that's what you want-- and over-layer for impasto appearance, and available in a wide array of colors, useful to landscapists, portraitists, or still life painters. They are OP's so don't expect them to perform well at high outdoor temperatures, and you might do well to have coated and textured (or sanded) support. I use a stump to blend, not a colorless blender, and it's easy to do. These colors are intense, often bright, but because they are easily blended, you can push them back for atmospheric perspective with (near) complementary colors, to achieve a wide range of hues. I heartily recommend these OP's as a great place to start, and as your primary OP's going forward. Rated 5 out of 5 by Anonymous from Vibrant I was very pleased with the color variety and quality of this product...even more so for the quantity and price compared to other brands. I have to buy a lot of supplies for college and I do not like to sacrifice quality to value, i want both and this provided both! Rated 5 out of 5 by Anonymous from Vibrant I wanted to do a school project with pastels, oil pastels in particular but did not want to spend a lot of money and still get a good color variety. I came across these and I was impressed. Great Quality at a Great Price...I would definently but these again and again. Rated 4 out of 5 by Tatiana from Erengi is a great product! Erengy is a great working Quarter horse. It is not overly fancy, but does the job, has great color choices and very useful, unless you need to go with super-realistic details (what i do with many of my studio paintings). However for my purposes I would put Erengy ahead of Cray Pass Specialist, what for me personally not more then 3 on a good day. Bottom line: Erengy is great for the money. Very useful for Plein Air, sketches, blocking and combination with more soft/expensive brands OR could be used by itself. Everything depends on your personal style of painting.